Carrot is among the most popular and versatile vegetables available in the world. Carrots contain essential vitamins, minerals and nutrients for overall health. Carrot juice offers good vitamin A and vitamin C benefits plus other nutrients for, overall, health of the body and the skin. They are not just used for rating them raw, or consumption in foods, dishes and salads, but also can be used in commercial and homemade skin care products. Let’s see some of the amazing health benefits of carrot juice here on this page. Carrots contain vitamin A in the form of beta-carotene. Drinking carrot juice can help maintain good vision, increases the body’s immunity, remove indigestible fibers, help in the prevention of cancer, heart disease and strokes. It contains natural sugars, so those that are diabetic would want to drink fewer amounts. The juice may not be appealing, for some, to drink all by itself, so add or mix it with other fruit juices to enhance its flavor. Right from the childhood we use to learn this that carrots are the best to consume daily to increase and retain the normal vision power. It contains beta carotene and lutein, both of which are in our retina. Beta Carotene is known to improve the immunity of the body and protects the skin and the eyes from the damage caused due to the presence of the free radicals and chronic diseases. Night vision power can also be increase with carrots juicet because the liver convert beta carotene into vitamin A, which is essential for your night vision. Carrot juice is high in beta-carotene, which studies show can reduce the risk of heart disease leading to high blood pressure. It helps to maintain normal blood pressure by regulating heart and kidney functions. Carrots are high in potassium, which can help prevent and control high blood pressure. It has been found that eating vegetables such as Carrots is known to decrease the rate of cardiovascular disease. Carrot Juice is known to lower down the oxidative stress in the body and also improves the defense mechanism of the body against various cardiovascular diseases. Beta carotene and vitamin A contents in carrot juice will slow down the damage of your skin cells, helping in reducing the signs of aging. Both wrinkles and sagging can be prevented by its juice. 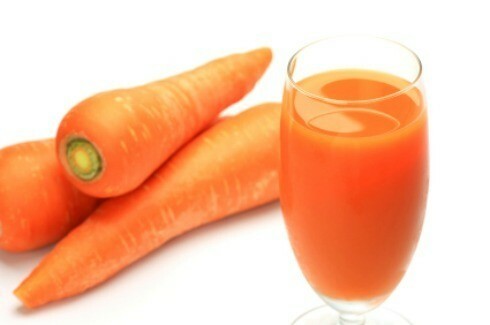 Even more, the detoxifying properties of carrot juice makes your skin clean and prevents acne. Drinking one glass of carrot juice before your meal would boost the extraction of digestive juices, improving the appetite in your body. This would also increase the working ability of your stomach and helps improve your digestion too. The antioxidants can act as a natural sun block and help in healing sunburns. The benefits of vitamin C helps promote skin elasticity, with collagen production. This juice helps improve uneven skin tone, prevents scars, revitalizes skin, helps get rid of blackheads, provides acne relief, has anti-inflammatory properties, promotes smooth, soft and supple skin. When drinking it with water, it keeps the body and the skin well hydrated. Just be careful and do not drink too much carrot juice. Carrot Juice is known to benefit the brain health by preventing diseases such as Alzheimer’s and improves the memory of the person, decreasing the chances of cognitive decline. Carrot juice contains a property to lower down the oxidative stress in the brain which can weaken the nerve signaling capacity of the brain.